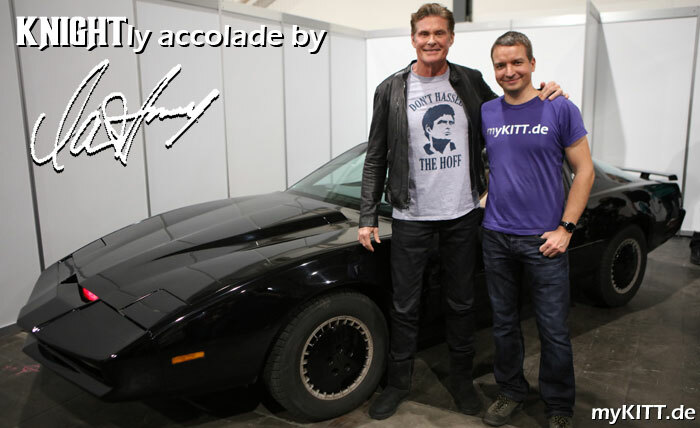 Deutsche Version David Hasselhoff, Rebecca Holden, Peter Parros & Michael Scheffe in my K.I.T.T.! 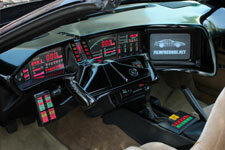 Can you build a K.I.T.T.-replica for me? I pay a lot of money! 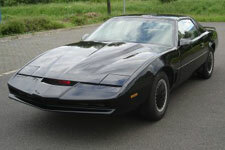 This website is about my replica of K.I.T.T. 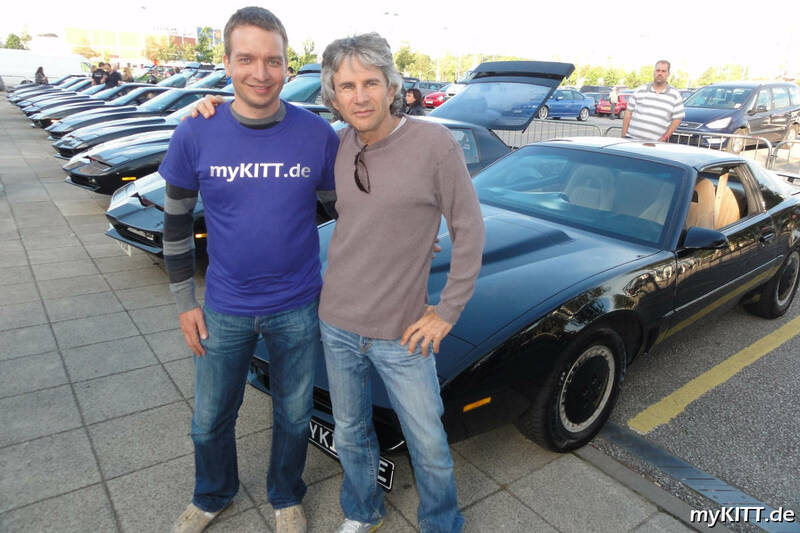 from the TV series "Knight Rider" with David Hasselhoff. You will find information about the parts I've used to build it and a complete documentation about the building process with many photos and videos. 2019-02-25 My K.I.T.T. at German Comic Con and ComicPark 2019! From 13th to 14th April 2019 my K.I.T.T. will attend the German Comic Con (Spring Edition) in Dortmund again! And from 28th to 29th September 2019 we will be at German Comic Con Berlin! Additionally, K.I.T.T. will also be at ComicPark in Erfurt on 27th/28th April 2019! From 20th-21st October 2018 my K.I.T.T. was on display again at the German Comic Con in Berlin. This time, even 9 of the star guests came by, including Michael Rooker, Billy Boyd, Kristanna Loken and AJ & Howie from the Backstreet Boys! In Spring 2018, I took some pictures with the sights and places of interest of my hometown. From 1st to 2nd September my K.I.T.T. attended the comicpark festival in Erfurt and met Ecto-1 and an X-Wing fighter. The "Street Mag Show" in Hannover is one of Germany's biggest U.S. Car Meetings. This year, my K.I.T.T. was a part of it again. When I visit car meetings or events, K.I.T.T. is often not the only car, that is famous from the movies and TV. I just made a collection gallery. My hometown Erfurt is not only very beautiful, but also called "Children's media town" because the German children's TV channel KIKA is based in Erfurt. In the city center, there are 10 famous statues of KIKA characters, so my aim was to take a picture with each of them and my K.I.T.T..
From 1st to 2nd September my K.I.T.T. will attend the comicpark festival in Erfurt. There will be Comics, Cosplay and an Ecto-1 replica as well. 2018-04-20 Article in newspaper "Freies Wort"
On April 20th 2018, Thuringian newspaper published a one-sheet article about my hobby and David Hasselhoff regarding his upcoming concerts in Thuringia. 2018-04-20 Interview with "Landeswelle Thüringen"
On April 18th 2018, I met with Michael Schemat from Landeswelle Thüringen for a radio interview. It aired on April 20th 2018 at 06:11 AM and 08:10 AM. On March 21st 2018, German TV channel ZDFneo has a rerun of "Kennste den?" from October 2017, where I was one of nine panel candidates. The show will air at 10:55 AM and 5:45 PM. On 17th November 2017, 11:00 PM CET German channel SuperRTL aired a rerun of "Es kann nur E1NEN geben" with K.I.T.T. and me from 2013. On 10th October 2017, I was candidate in the German TV quiz show "Kennste den?". The show aired on 31st October 2017 at 7:30 PM on German TV channel ZDFneo with 680,000 viewers. On 30th September and 1st October 2017 my K.I.T.T. was on display again at the German Comic Con in Berlin. My special highlight was a meeting with Tom Wilson, who played a small role in epdisode "A Knight in Shining Armor". I also met some other stars like Lee Majors, Pamela Anderson and 6 actors from "Game of Thrones". 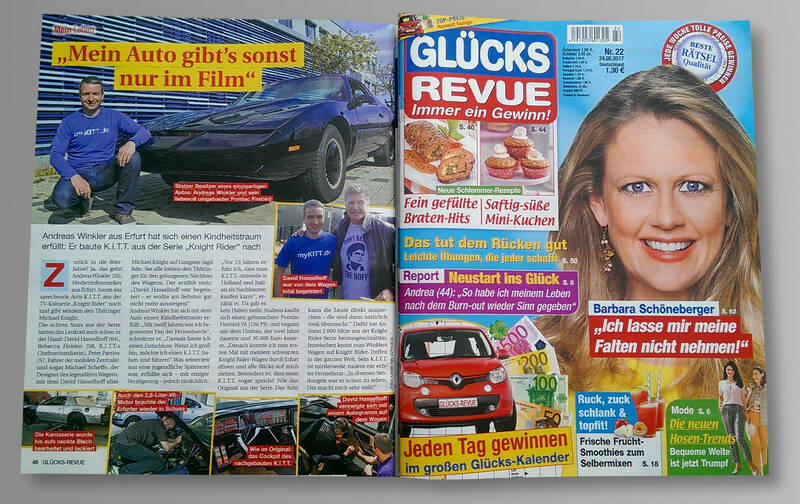 The first press article from the shooting on 6th April has been published in "Glücks-Revue" (issue 22/2017) today!